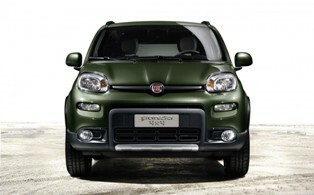 Italian automotive giant Fiat will be showing off their new Fiat Panda 4×4 in the upcoming Paris Motor Show. It would be first and only car in the A segment market to have a 4WD system installed. The 5 door model will come with 2 new colours namely the Toscana Green Metallic and the Sicilia Orange pastel. The Paris show is scheduled for later this month and the Panda 4×4 is designed with 2.30meter wheelbase while it has a new green fascia variant. Depending on the colour of the body, you could also opt for matching seat fabric colours too. Essentially, it is a ‘torque on demand’ transmission system that comes with a permanent 4WD system as and when needed. It has 2 differentials and an electronically controlled coupling system where the ESC with ELD (Electronic Locking Differentials) are invoked with the car is negotiating uphill terrains which are slippery. Independent MacPersons struts are installed for the front and you get 2 engine choices, namely the 0.9 liter TwinAir Turbo mated with a 6 speed gearbox and a 1.3 liter MultiJet II diesel engine both of which comes with the Start & Stop systems respectively. Apart from that, it comes with 15” burnished alloy rims, climate control system, an MP3 radio system, rear head restraints and others.